Life in 'The Wilds' is one never-ending tension-filled existence. No one knows this better than veteran Runner Daisy.If it's not a compound mired in bureaucracy, it's the increasingly dangerous world outside its walls. Add some complicated personal relationships and the drama never ends. We get more details about how this post-apocalyptic world came to be. A mysterious bacteria infected the population mutating humans into zombie-like abominations, as they're called, becoming a sort of botanical host that blossoms with flowers eventually returning to the earth. They are attracted to the non-infected. In a way, it's Mother Nature's revenge to reclaim the world that man has spoiled. Writer vita Ayala understands that no matter how devastating a future world one creates if the reader isn't invested in the people that populate it the story is dead. Her characters are under constant tension that permeates their lives. Anyone who's ever worked in some kind of corporate setting knows what it's like to be constantly reminded of standard operating procedures and consequences for veering away from them. Daisy's boss is one of those guys who is by-the-book and revels in his power. There is little tolerance for improvisation as a runner and hoarding of any kind will not go unpunished usually. It makes for quite the stringent workplace. In the first issue, Daisy and her girlfriend, Heather had a terrible argument and that gets resolved here. It's another well-written scene with dialogue that sounds natural as both characters express their viewpoints respectfully but with empathy and understanding. It shouldn't sound as rare as I make sound here but few comics take the time to humanize their characters and they usually fall into caricature instead. Again, we want to invest in this people and writing like this brings us closer to understanding who they are and what they stand for. There is increasing danger not just from the growing numbers of abominations Daisy has encountered but the conflict among other runners at the compound. There is this uneasy alliance among everyone at the compound that is ready to fracture from divisiveness and jealousy. What belies this subdued rancor is the beautiful art by Emily Pearson and Marissa Louise. The precise and clean lines soaked in bright vibrant colors betrays the danger and conflict that drives the narrative. The violence itself gets washed in a monochromatic scheme that heightens the attack. It's as though the beauty of the world blossoms in spite of humans not because of it. Even though a terror stalks the streets and roads of this new reality the real ugliness comes from people's selfish feelings. 'The Wilds' exposes the trappings of our egos and the ultimate failings of us as human beings to one another in an otherwise picturesque landscape. 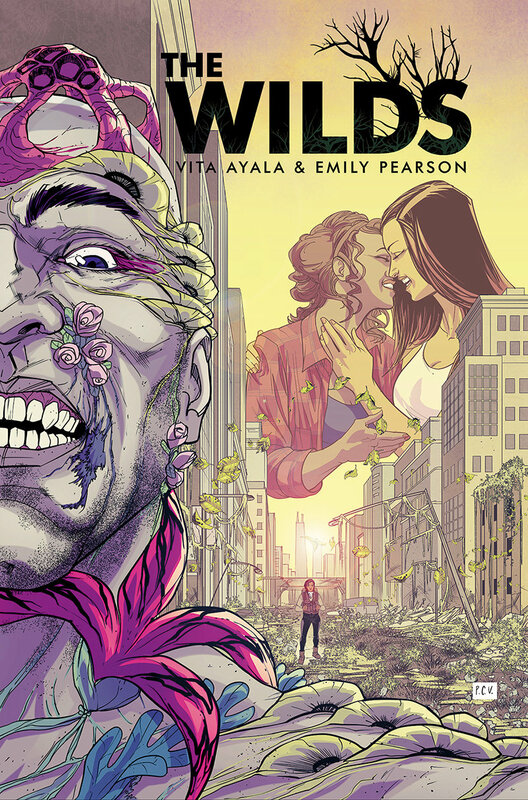 'The Wilds' continues to evolve as a complicated human drama amid an outbreak of terror. Ayala tightens the tension around the protagonists leading to some unexpected twists. Pearson and Louise give us the dichotomy of a gorgeously rendered world fraught with danger and distrust. Like any good post-apocalyptic story, the only thing worse than the event itself are the survivors that follow it. Don't miss it.